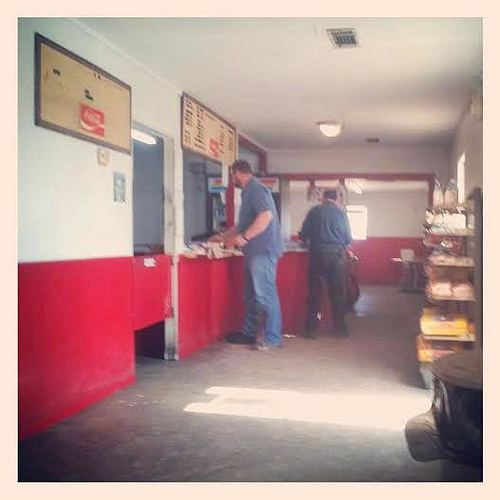 Brinson’s is a well-loved institution in Jenkins County. 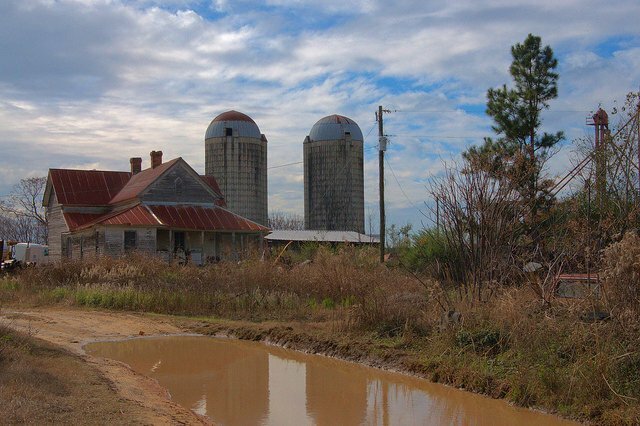 Located south of Millen on West Old Savannah Road, you’ll know it’s open if there’s a plume of smoke pouring from the pits behind the simple cinder block building and a parking lot full of pickup trucks. Unless you have a big appetite, order the small barbeque plate. I ordered the regular and it was enough food for two people. (They also have a large plate). The sauce is a bit tangier than you’ll find further south in Georgia, but it was very good. And the Brunswick stew was served over rice, not something often seen in restaurants. Three slices of Sunbeam bread, a generous helping of potato salad, and Brinson’s sweet tea complete this classic Southern meal. Brinson’s actual address, in case you need to put it in your GPS: 3924 West Old Savannah Road, Millen, Georgia 30442. Their telephone number is (478) 982-4570. 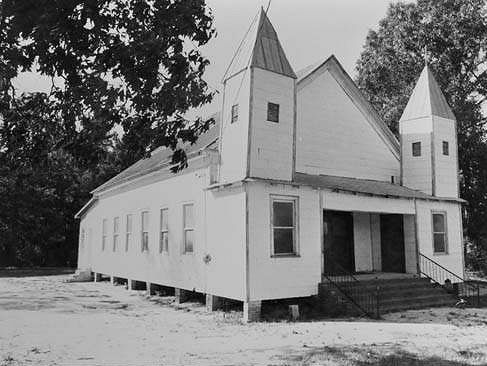 The image below was made in the 1970s (Credit: Vanishing Georgia, Georgia Archives, University System of Georgia). 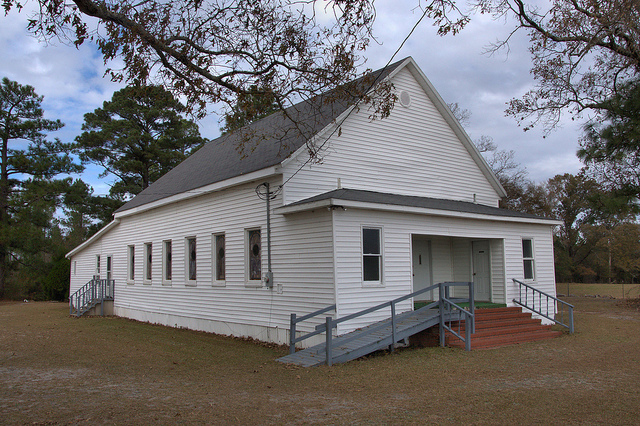 It shows the original vernacular steeples, obviously removed sometime thereafter. There are lots of cotton farms in this area off the Old Savannah Highway south of Millen. 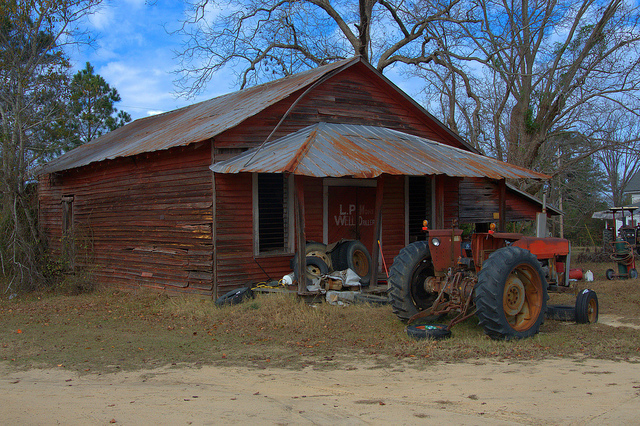 In fact, the oldest cotton farm in America (Juanita M. Joiner Farm) and the oldest timberland company (Southern Woodland Company) are operated by the 8th generation of the family on lands dating to 1783.This relic, located in the vicinity of the farm, probably served the now-forgotten community of Emmalane as a general store or commissary. A wonderful hand-painted sign on the door reads: “L. P. Mons, Well Driller”.